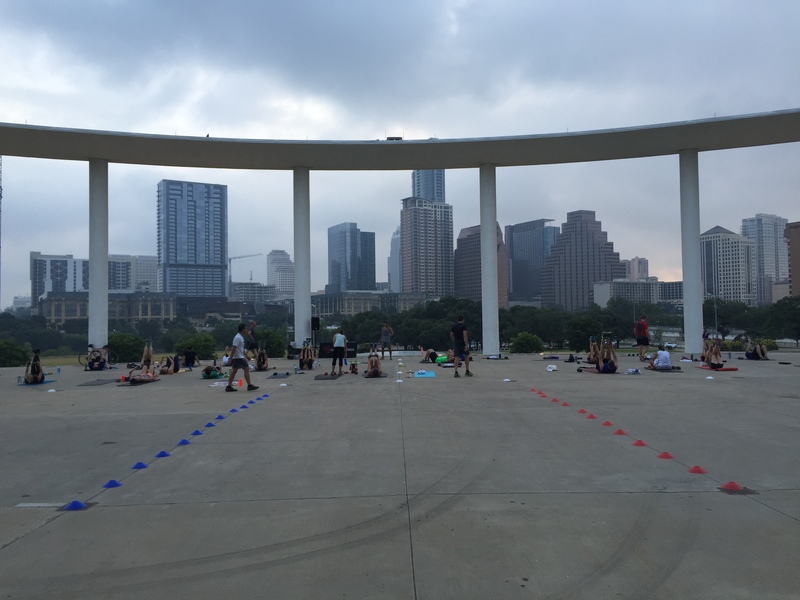 Camp Gladiator Austin -a motivating fitness bootcamp. 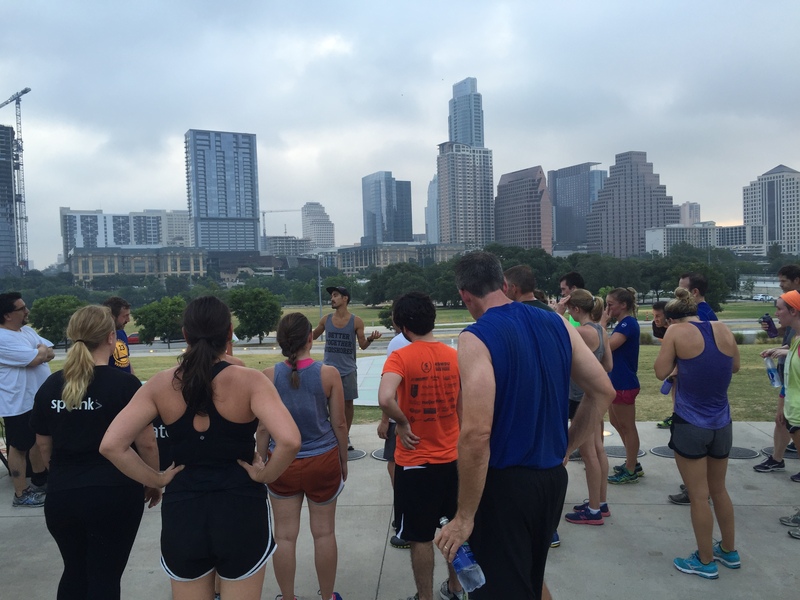 Camp Gladiator Austin or CG for short, is a fitness bootcamp with locations all over town. As well as, locations all over Texas and the U.S. CG holds 4 week programs that are designed to change your body both physically and mentally. They motivate you to push past the goals you have set for yourself, to give you results. Each workout is different, and for a specific reason, to keep your body guessing so you never plateau. The results: you continue to get stronger and leaner. Their main facility (arena) is located close to the intersection of highway 183 and Burnet Road. Which is where they offer indoor classes like boxing, kickboxing, strength/weight training, agility, speed, interval training, yoga, and so much more! The workout I attended was at the Long Center Pavilion located in Downtown Austin. The scenery was beautiful which helped to distract myself when things got tough. We focused on agility and speed with some strength and ab training, as well. Now, although I love running, I am not a great runner by any means, especially compared to the other people that were there. As I was panting for air in the back of the pack, the others swiftly ran right by. Obviously I need to work on my speed skills. The workout itself consisted of things like circuits with fancy footwork between cones, burpees, short (but quick) runs around the pavilion, hand weights, and some abs. I was SO SWEATY by the time it was done, which you can most definitely see in my Instagram post. No shame! This bootcamp really pushed me past my limits. I don’t usually do speed or agility training, so it was fun to switch it up! If you want to try them, you can go to their website and register for a free guest pass that lets you go for a day and try a workout as well as a tour of the facility. If you don’t have time to go in or make an appointment, you can always just stop right on by and they would be more than happy to give you a tour right on the spot! CG also offers free bootcamps on the weekends that are open to the public! A free bootcamp I attended, at the Whole Foods Domain parking lot, was actually the first time I had gone to a CG workout and it was completely different from the workout I did today. It was more weight and strength based as opposed to the speed and agility. Personally, I don’t like to lift a lot of weights, especially for an entire workout, but none the less it was still a great workout if you like that type of training, and it was awesome getting to know the CG community! “Camp Gladiator Austin” does sound a little intimidating, I know, because I was a little scared to try one of their classes at first too. But the atmosphere and the trainers are all really fun and inviting and you get a KILLER workout! They have options for everyone no matter what age or fitness level you are at so I strongly encourage you to try them out! ABOUT: More than a fitness boot camp. It’s an experience. Created by American Gladiator Grand Champion, Ally Davidson. This is a 4 week adult fitness boot camp that promises a challenging and motivating environment where women and men of all fitness levels and ages can push themselves. It’s designed to increase your functional strength, stamina, speed and most importantly, deliver results. TIP: Expect a total body workout. A typical session can include sprint and agility drills, stations, interval training, plyometrics, cardio mix, body weight strength drills and more. ABOUT: Living up to the motto, Live Adventurously, CG is now embarking on a new adventure, conquering and revolutionizing the indoor fitness space. Group fitness. TIP: Revolutionary Group Fitness CG Arena offers an innovative and unique approach to the traditional gym, with a focus on group fitness.